Whether you need residential or commercial pest control services, Colorado Pest Management is your go-to pest control company in Denver. We specialize in safe and effective pest control solutions for a variety of insects, including spiders, ants, bed bugs, cockroaches, wasps, bees, and more. We also offer multi-family housing pest control for landlords and property management companies. Call our team for a free estimate. Colorado Pest Management Co is a veteran-owned company that has been serving the Denver area since 1989. Our professionals understand the unique pest and wildlife control challenges along the Front Range, and we’re dedicated to providing safe and effective pest control solutions to residential homes and commercial properties throughout Colorado. We utilize a unique method of pest control called Integrated Pest Management, which is an eco-friendly, kid-friendly, and pet-safe way to rid unwanted spiders, ants, termites, and more from your property. Get your free estimate online or contact our team of professionals to learn more about our pest control and wildlife control solutions! Pavement Ants – Pavement ants are small insects that can appear brown to black in color. They like to build the entrance to their nesting areas between spaces in the pavement. This can mean trouble if you have a backyard pool or sidewalk on your property. These ants are also known to saunter into homes in search of food, so keep an eye out for them in your kitchen and pantry. Carpenter Ants – Carpenter ants are a large species of ant that usually looks black in color. 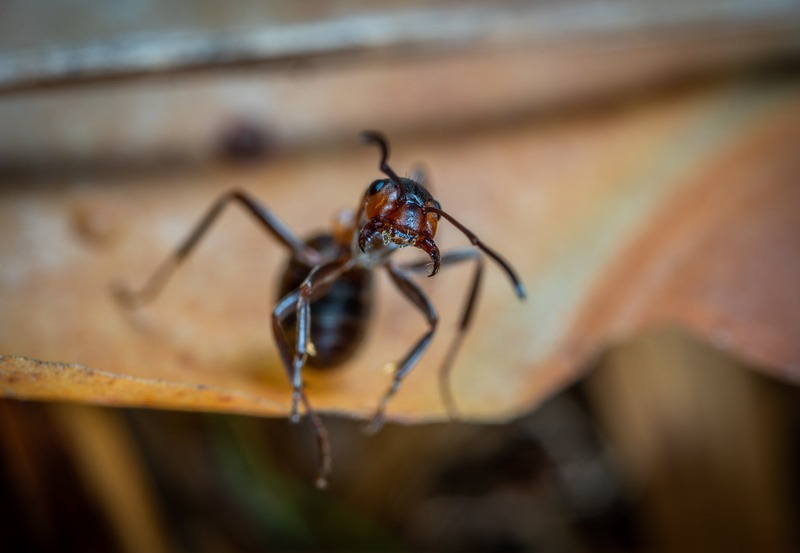 While they do not eat wood, these pesky ants are known to invade the wood around your home to create tunnels for nesting and hibernation needs. These ants are most drawn to wood that is unstained and unpainted, and they can also be found burrowing in wood that has experienced past water damage. If left untreated, an infestation of carpenter ants can cause significant damage to your home. Sugar Ants – Sugar ants are relatively easy to spot because they have a distinctive black head and a brownish-orange body. As their name suggests, these ants are drawn to sugary foods, so you’ll likely find them in the kitchen or pantry. Bed bugs are nocturnal parasitic pests that can be a huge nuisance if left untreated. These insects love to feed on the blood of mammals, and unfortunately for us, human blood tends to be their favorite meal. While these bugs are known to be relatively harmless, meaning they don’t transmit any known diseases to humans, their bites can lead to small red bumps or welts. When left untreated, they can become infected and may even require medical attention. If you’re concerned you may have bed bugs in your home, contact the pest control experts at Colorado Pest Management Co today. Boxelder bugs are small insects that have distinctive red and orange markings on their body. These bugs tend to cause problems during the late summer and fall months, as they start to seek out shelter from the cooling weather. While you don’t need to worry about these bugs biting or stinging you, if you find one on your property, there’s a good chance there are others. These insects love to travel in large numbers, and many homeowners will find their excrement on walls, furniture, curtains, and more. German Cockroaches – German cockroaches can be identified by their tan to light brown color. While these cockroaches have fully developed wings, they do not have the ability to fly. 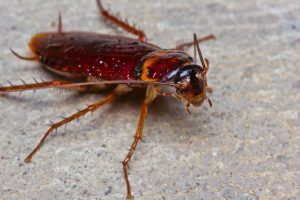 You can find these pests invading kitchens and bathrooms. American Cockroaches – These large cockroaches are able to fly, and the usually have a reddish-brown to mahogany color. They can be identified by a distinctive yellow band behind their head. While black widow spiders are often associated with the southwest, they are actually native to Colorado. You can easily identify these spiders by the red hourglass marking on their underside of their body. These venomous spiders love to find shelter in dim basements and garages, so be sure to keep an eye out in your home. Colorado Pest Management Co is also a leading provider of wildlife control and exclusion services throughout the Denver area. We specialize in safe, humane, and effective animal trapping and removal and all of our technicians are trained and certified by the National Wildlife Control Organization of America. When you call our wildlife control specialists, we’ll schedule a convenient time to come to your home or business to inspect your wildlife problem. 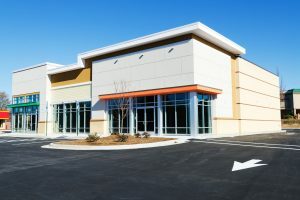 Our on-site consultations include an inspection, evaluation, and thorough consultation for $90, which will be applied toward the completed service. Raccoons can be found virtually anywhere in Colorado, and these medium-sized mammals like to reside in both urban and rural areas. If threatened or cornered, raccoons can become very aggressive, especially if they are looking for a new food source. You’ll likely find raccoons scavenging through open trash receptacles, and during the winter months, these masked bandits will be looking for a place to live. If you start to hear the tiny pitter-patter of feet in your attic or under your deck, it may be time to call a wildlife control specialists. Skunks, as you likely already know, have a very distinct look. These medium-sized mammals are usually mistaken for cats, but their smell is what makes them truly unique. When a skunk feels threatened, they will spray a very pungent liquid from glands found at the base of their tail. Skunks are always searching for shelter, and they’re not afraid to dig underneath the foundation of your home or your deck to create a burrow. 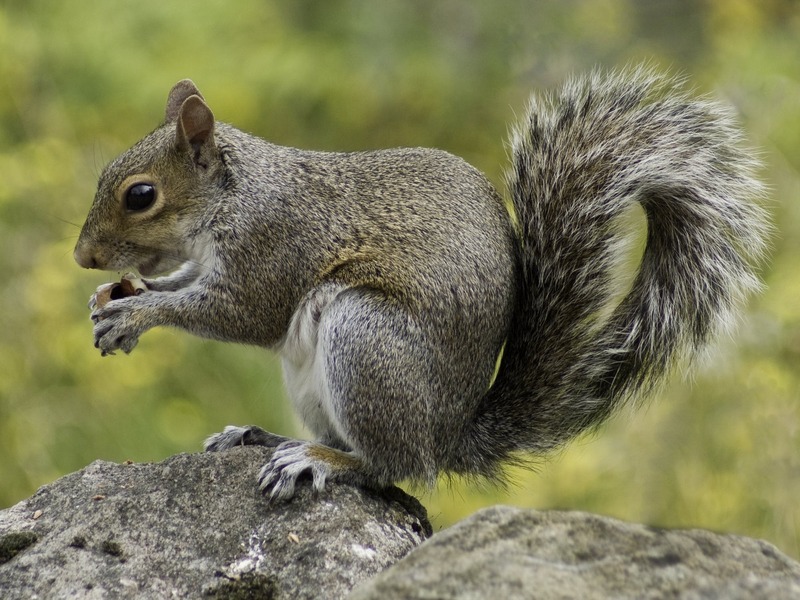 Squirrels are usually found outdoors, but did you know that these rodents can cause extensive damage to your home or business? These tiny animals are known for chewing through structures such as drywall, pipes, and insulation. They have also been found to transmit diseases like leptospirosis and other parasites like fleas, mites, and ticks. While you can find these tiny rodents in trees, they are more than happy to make a home in your attic or in the wall of your business. Voles, also called meadow voles, can be found all along the Front Range. These small mammals like to reside in grasslands and wooded areas, and they tend to prefer wooded areas. They like to feed on grasses, weeds, twigs, and live bark, so you’ll likely find these critters hanging out outside of your home or business. Voles are not considered dangerous to humans directly, but they can spread diseases through their droppings and they can cause damage to your lawn, garden, and trees. 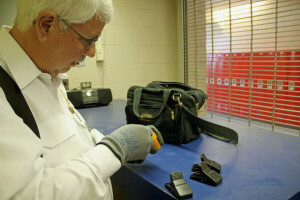 In the great state of Colorado, there are two main types of mice to keep an eye out for: house mice and deer mice. Each of these mice are similar in size, but they have different coloring. The house mouse has a smooth fur coat that is usually grayish brown. The deer mouse, on the other hand, is bi-colored, and can range from pale grey to deep reddish brown. Not only can these critters pose a serious health risk to you, your pets, and your home, they can spread serious diseases through their droppings. When mice get into your home or business, they can chew on drywall, wood, and even electrical wires. 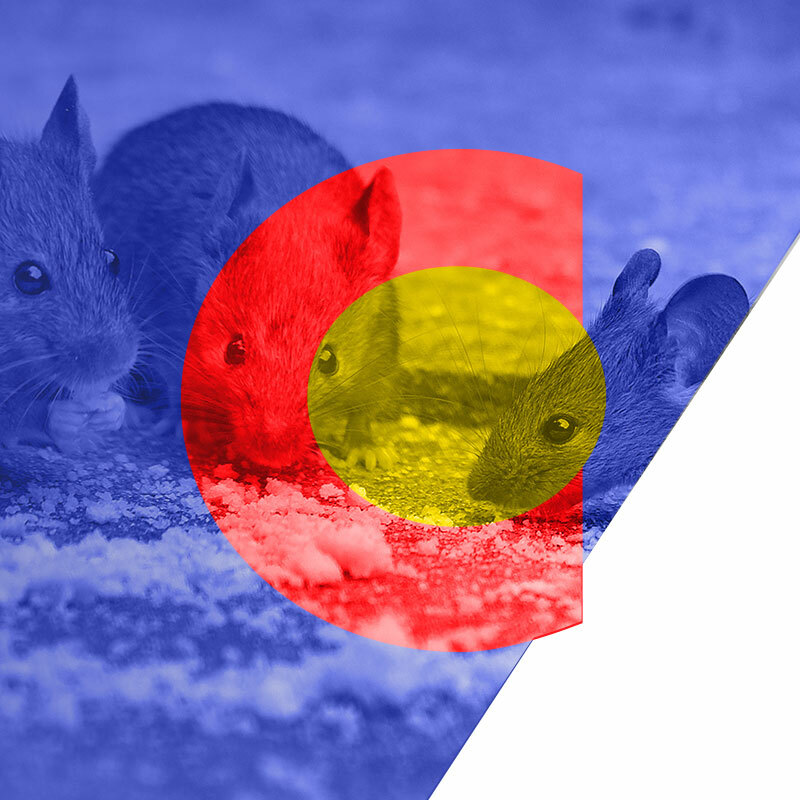 If you’re concerned your property may have a mice infestation, contact Colorado Pest Management Co right away. Rabbits may be cute and adorable, but in large numbers, these animals can wreak havoc on your garden or lawn. These mammals can also introduce fleas and mites to your yard, spreading these parasites to your beloved pets. Rabbits love to feed on plants, and they can demolish your vegetable garden in a matter of hours. While birds are absolutely beautiful to spot in the wild, they can cause serious damage to your home or business. The state of Colorado is home to more than 400 bird species, and nuisance birds can be very challenging to get rid of due to the federal laws and limited removal methods. As a result, hundreds of homeowners are faced with federal charges for trying to remove bird nests from their property. This is when it’s time to call Colorado Pest Management Co for help. If you start to notice any of the bellow birds in your yard, attic, or place of business, contact our bird control team today. Pigeons – If you live or work in the metro Denver area, there’s a good chance you’ve seen numerous pigeons hanging outside of your home or office. Pigeons are the number one nuisance bird in heavily urbanized areas. 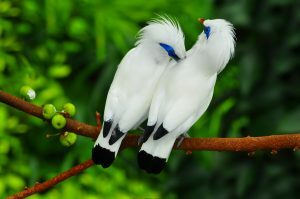 Their bird droppings have a high acid content, which can pose a serious risk to commercial buildings and family homes. Starlings – Starlings are another nuisance bird to look out for in the Denver area. These pesky birds love to munch on small fruits like grapes and apples, and you can often find them nesting in your attic. Woodpeckers – Woodpeckers are known for drilling holes into trees with their beaks in search of food or to communicate with other woodpeckers. If they can’t find a good tree to peck on, they’ll start to drum on wooden siding, metal, chimney caps, and even plastic gutters. If you fail to take care of a woodpecker problem, it can lead to costly repairs down the line. If you currently need assistance removing unwanted nuisance wildlife from your home or business, contact the specialists at Colorado Pest Management Co today. Our wildlife removal experts offer humane and economical wildlife control services for homeowners and business owners, and we’re dedicated to your complete satisfaction. If you have any questions about our pest control and wildlife control services, reach out to our friendly team today! We care about you and your property. We are dedicated to protecting your health from household pests and pest-related threats. We have the experience and expertise to rid your family and your home of pest threats while maintaining your quality of life. We are your proven pest management experts. Work with real people that you can TRUST. We are locally owned and operated and we support the local economy. We use Integrated Pest Management methods for controlling pest problems. IPM creates a partnership between you and your licensed pest professional. By working together, you can have the peace of mind that your family and home will be protected against pest-related health and property threats. These methods are safe for kids, pets, and the environment. We treat for insects, rodents, bed bug, and control four-legged wildlife and birds.